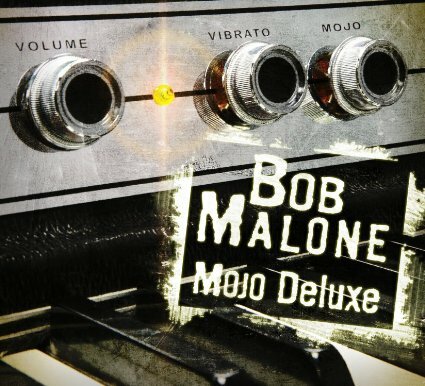 I just received the newest release, Mojo Deluxe, from Bob Malone and it's got something special. Not only is Malone a skilled keyboardist, vocalist and songwriter, he has given me "Cliff Notes" on some of the tracks telling me what he's singing about. You gotta understand, I'm a musician, not a poet. You need to hit me in the head with a line if you want me to get it...I'm listening to the music. The release opens with an uptempo rocker, Certain Distance, with a driving beat compliments of Kenny Aronoff (drums), Jeff Dean (bass) and Chris Trujillo (percussion). With nice backing vocals by Lavone Seetal and Karen Nash, this track rocks. Bob Demarco rips the slide and Stan Beherens on harp round out this organ driven track about Malones struggle with introversion. He sounds happy with it so I guess that's ok! Toxic Love has a more stable blues rock platform with nice slide dobro work from Demarco. Malone handles lead vocals and adds some real nice key riffs. Behrens is back on this track as well with tight harp riffs. Ray Charles track, Hard Times is a really nice selection for Malone. His vocal and piano style work well with Charles basic format. Demarco plays a outstanding guitar solo on this track pushing Malones vocals forward. Excellent! I'm Not Fine is another track with a specific message. Malone sounds like a friend of mine who always puts on the fine face but really just wants things to be better. Mostly a pop formatted track, Seetal and Sarah Nolan add some real nice backing vocals to Malones lead vocals and Clav work. A somber ballad, Paris, describes the loneliness of being on the road even in the most romantic towns on earth. A solid radio track with tension and melody, this track has guts. Looking For The Blues has a Leon/Cocker feel with some particularly cool piano rolls. Marty Rifkin lays in some real nice slide riffs and horn backing from Lee thornburg (trumpet), Nick Lane (trombone) and Tom Evans (sax) give it a sassy feel. Rage & Cigarettes has a cool groove driven by Jeff Dean on bass and Malone's Wurlitzer. I particularly like Malone's vocal delivery on this track and Mike Baird is real tight giving the track real snap. Demarco lays down another set of tasty guitar riffs setting this track off nicely and Seetal and Nash do a great job on backing vocals. Muddy Waters' She Moves Me goes right down the center of blues alley. Malone takes a healthy piano solo on this track with only rudimentary backing by Demarco, Tim LeFebvre on bass and Beherens on harp. Rolling blues, Don't Threaten Me (With A Good Time) has a Jimmy Reed basis and really warm backing vocals by Seetal, Nash, Ali Handal, Amy Englehardt and Trysette. This track had a fine balance of keys, guitar and horns with the vocal harmonies being it's strength. Watching Over Me, although country influenced, reminds me a bit of an early Elton John composition. A tale of a down and out musician who gets a break when he has nothing, inspired this track. Gospel like backing vocals from Seetal, Nash and Trysette with stylized piano work makes this a solid leader for best on release. Very nice! Chinese Algebra purportedly contains all of the eclectic elements of Malone's playing. I hear some definite familiar riffs and it is a clever track, mostly jazz rock like...very cool! Wrapping the release is Can't Get There From Here, the thoughts of a middle aged man looking back and forward at his life. Demarco's dobro work under the backs key and vocal by Malone sets the tone and again super vocal backing by Seetal, Trysette, Sarah Nolan, David Manuel, and Charisse Lucena make a nice impact. This is a really nice release with a solid vocal impact.